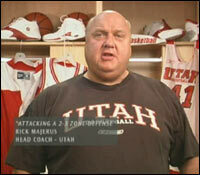 Rick Majerus is slated to appear on a College Basketball GameDay program for the 2005-06 NCAA basketball season. GameDay will travel to college towns to provide onsite commentary of significant games on the ESPN schedule. Visit Lammi Sports Management for info or to schedule an appearance in Wisconsin. Please e-mail kbrews@cox.netif you know of any coming appearances. Rick Majerus wrote the forward to a recently published book about the Marquette Warriors' run to the national title in 1977. Rick was an assistant to Al McGuire at the time. Click here for more info on Goin' Uptown: Marquette's March to Madness and Return to the Final Four, by Joseph Declan Moran. A childrens' sports book on Keith Van Horn was published in 2002. Read my review and get more info. 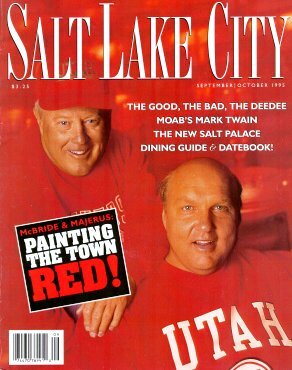 In 1999 Rick Majerus and ESPN Magazine sports writer, Gene Wojciechowski, collaborated on Rick's biography, My Life on a Napkin: Pillow Mints, Playground Dreams and Coaching the Runnin' Utes. See link below to order online. Rick sang "Take Me Out to the Ballgame" at Wrigley Field, August 10, 1999. NCAA Tournament in-studio analysis on CBS March 20-21. ESPN, March 1, 1999, Guest on Up Close. HBO, August 15, 1998, Guest appearance on Arliss (literally Arli$$), an HBO comedy. Raconteur Rick gets a smirk from fellow guest Billy Crystal. Original material © 1998-2007 Keith Brewster. Others as noted. Not endorsed by Rick Majerus or St. Louis Univ.